We are happy to announce the successful implementation of the project “On your marks… study, dive, protect!” This is the 15th project funded and accompanied by Ecofund. The project was born thanks to the initiative of Professor Malick Diouf at the University of Dakar, his Msc. 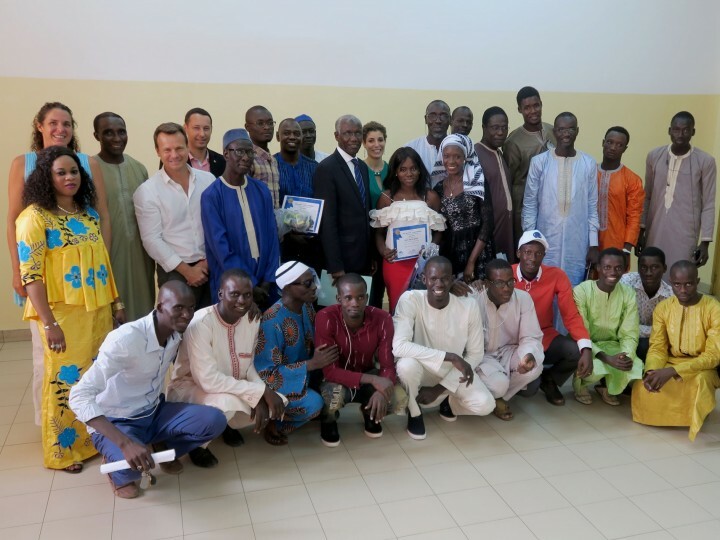 students in 'Aquatic Eco-systems Management' and thanks to the collaboration with the Barracuda Club Dakar. Many thanks to all of you for your support and donations! Special thanks to the Rotary Club Dakar for filling the budget gap! The project’s results are best resumed by the passionate scientific articles written by our three students freshly graduated at PADI Open Water Divers. The articles translate best how the opportunity of diving, and thus observing the natural underwater environment for the first time, has positively impacted their studies. During the diving sessions the students collected few specimen for further observation and study at the University of Dakar. We invite you to visit our “Green News > Ecoblog” page and to read the articles on three specimen, of which you would not imagine the virtues and the utility for our oceans and our lives. The more a scientist “dives” into the natural environment, the more he gains know-how and proficiency. This seems obvious, however this is not the common practice during the 'Aquatic Eco-systems Management' studies at the Cheik Anta Diop University in Dakar. This first underwater diving training has been a pilot project and – to our opinion - a real success. 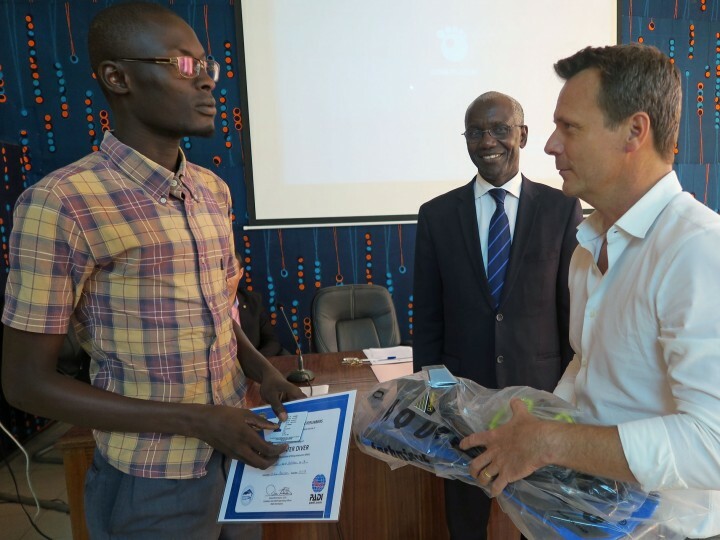 We hope Professor Malick Diouf can capitalize on this success, so underwater diving training becomes part of the university syllabus to help students become future champions in the protection of marine ecosystems in West Africa. To be a scientist working on preserving our ecosystems is good, being a passionate scientist and communicating your passion is even better. This helps a lot to spread the knowledge and sensitize people to adopt an eco-responsible behavior. 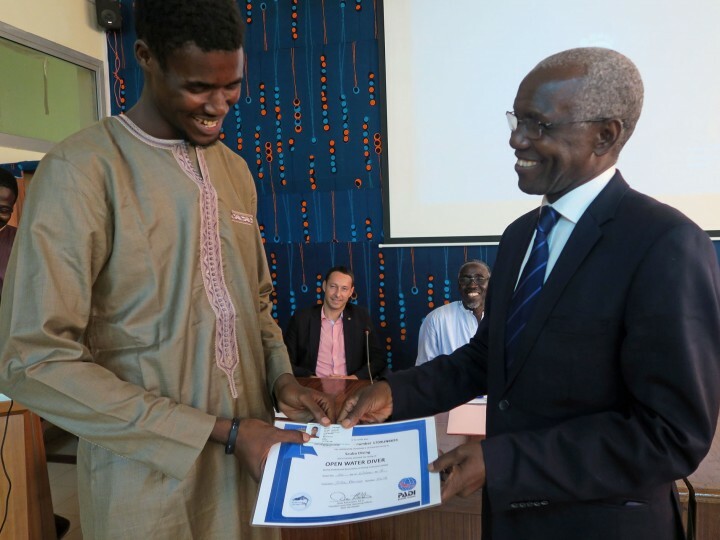 During project implementation, our three students have demonstrated their eco-responsible behavior by participating actively in cleaning-up sessions of the N’Gor bay in Dakar in Senegal and its underwater environment. The cleaning-up sessions were organized by Julie, Nathalie and Franck from the Barracuda Club Dakar. For example, on the World Oceans Day, in less than 2 hours, 1 ton of garbage was collected, of which 650 kg on the beach and 300 kg under water!!! This is good but how much waste lies still on the bottom of our oceans? More than ever, our three champions will need to develop ideas on the ways how West Africa can strengthen protection of its oceans. During project implementation we also encouraged the students to demonstrate their ownership by co-funding this pilot project by their university mates. Crowdfunding is not yet an established practice in West Africa since contributing 10.000 Francs CFA (15 euros) represents a lot of money for a student in Senegal. Therefore, the fact that they succeeded to raise among their university mates 300 Euros is an encouraging step. Though it is a partial amount (17% of the project budget), the symbol is important since the University and the students want the underwater diving training to become an integrated part of the master course in 'Aquatic Eco-systems Management’. 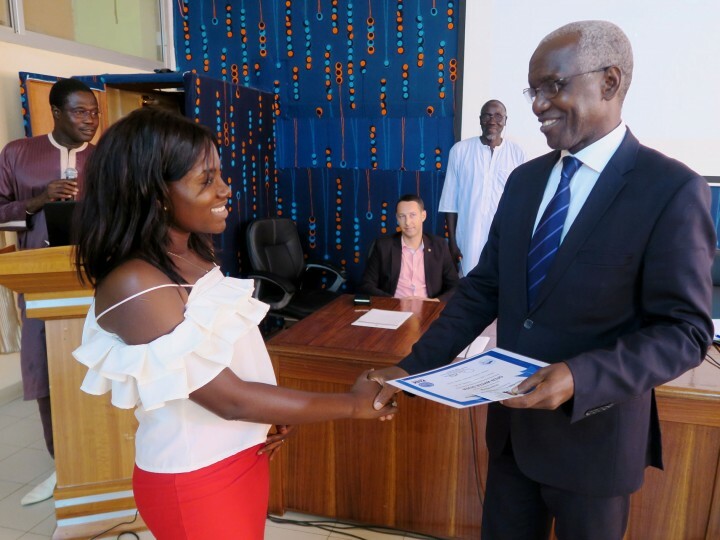 Alike Fatou, Amadou and Babacar, the students will need to merit the diving training and also prove its utility for science and the protection of oceans. Last but not least, we want to congratulate Fatou, Amadou and Babacar and wish them all the best for their future as professionals in protecting the aquatic environment. Enjoy their articles, which may give you the stimulus to explore the underwater world in West Africa.